What are the Friends of St George’s? The Friends of St George’s and Descendants of Knights of the Garter are a network of individuals who support St George’s on a regular basis. Founded in the 1930s the Friends offer financial support to the Dean and Canons of Windsor on whom the sole responsibility to maintain St George’s Chapel and the surrounding Collegiate buildings (about ¼ of Windsor Castle) lies. However there is much more to the Friends than offering financial support; they are part of the wider community making up a network of over 5000 members worldwide. 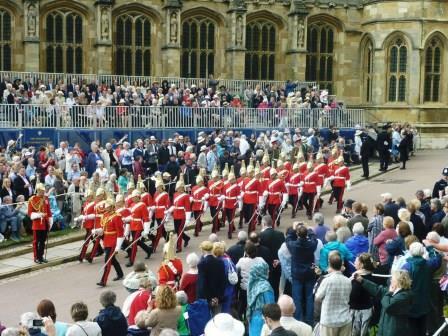 Visits and outings are arranged for Friends each year; this year the visits include the Royal Military Academy, Sandhurst and the Tower of London together with private Chapel tours one of which focuses on Heraldry. There is also the opportunity to attend Garter Day in June; this is the occasion on which The Queen, members of the Royal Family and Members of the Order of the Garter process through the Castle precincts to St George’s Chapel to attend a Thanksgiving (and sometimes an installation) Service. The procession is led by the Constable & Governor of the Castle and the Military Knights of Windsor, Officers of Arms (Heralds) follow and then come the Companions of the Order; the final part of the procession consists of the Royal Family and Yeomen of the Guard.